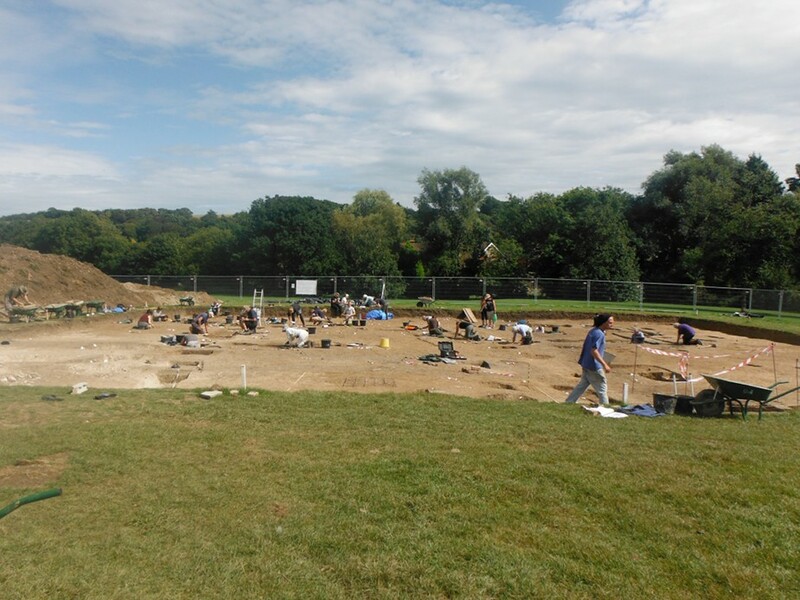 The past few days have been very hectic as we enter the final week of the excavation! The site is a hive of activity and the core team have stopped taking their day off so that the paperwork can be finished and all those little extra things that get left behind when supervising on site can be done. We have an awful lot to do this week, but we’re confident that we’ll get it done in the time we have left. 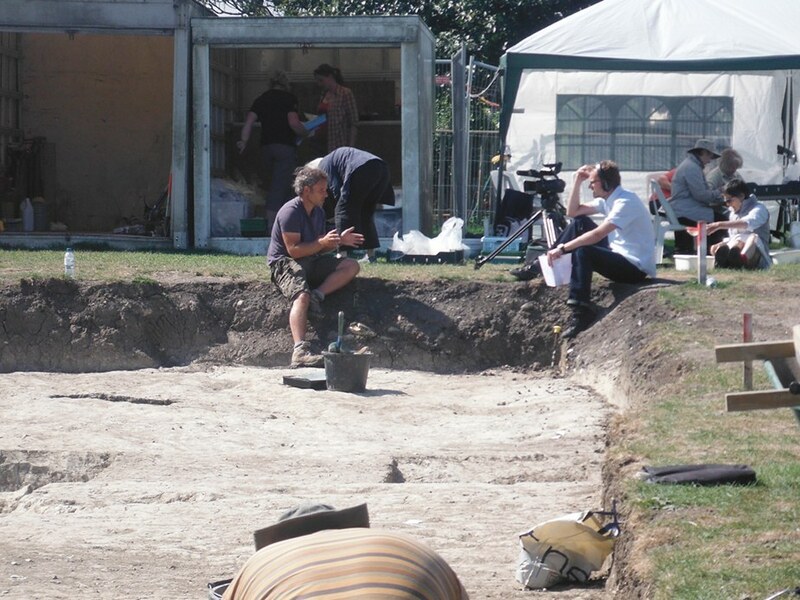 The trench is full of people getting all the last features excavated and recorded by the end of this week which is in fact the end of this seasons excavations! The hall building is continuing to provoke questions and provide insight into construction methods. We are finding more internal divisions in the eastern end of the hall, although they are incredibly ephemeral. The massive doorway post pits are finally fully excavated. 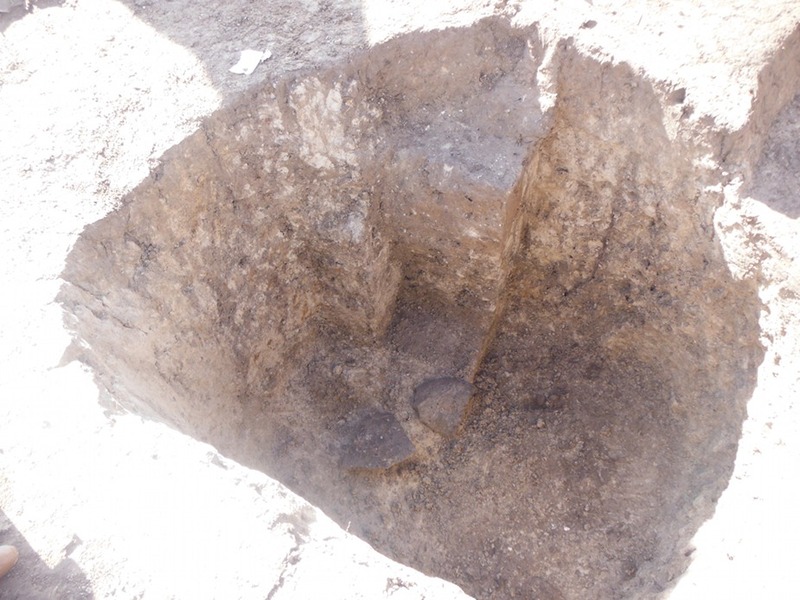 It has been rather sunny so it is a little difficult to see, but at the bottom of one of the post pits we discovered two large pieces of quern stone. Perhaps they had been placed to add support to the structure, or perhaps they were added as carefully placed foundation stones? Broken quern stone (for grinding wheat into flour) at the bottom of one of the hall building main door post pits. Surprisingly, the wall trenches of the hall continue to be productive finds-wise. Other excavated examples of Saxon halls tend to be very unproductive, making it difficult to date these structures accurately. 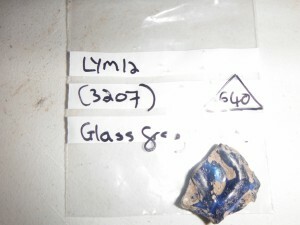 Blue glass with decoration – still needs to be cleaned! 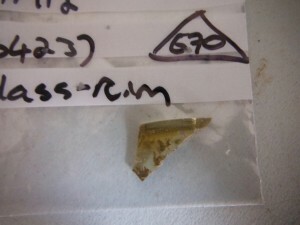 We have pieces of glass from the wall trench, which will absolutely help in dating. The quantity of glass we are finding is remarkable, and the fact that they are in context in archaeological features is really wonderful. 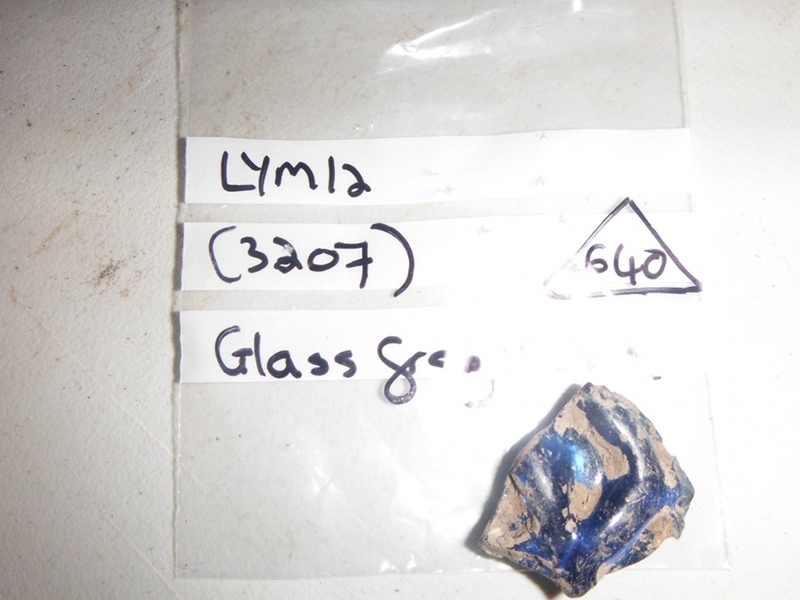 This piece of blue glass is also rather lovely, with its latice work trailing. 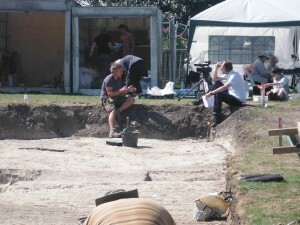 Last week we welcomed the BBC to the trench to interview Gabor and a few of us about the site. 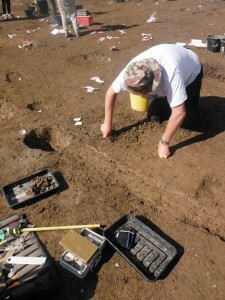 We don’t know yet when it will go out as this year archaeological digs are secondary to the Olympics and Paralympics (! ), but I’ll be sure to let you all know when they give us a date. Gabor was interviewed extensively, and they took lots of shots of the site, but they also interviewed several of our local volunteers as well as Helen and myself – our television debuts! Lyminge is certainly highly significant to the history of Kent and the introduction of Christianity, and we are pleased that the media are recognising this. 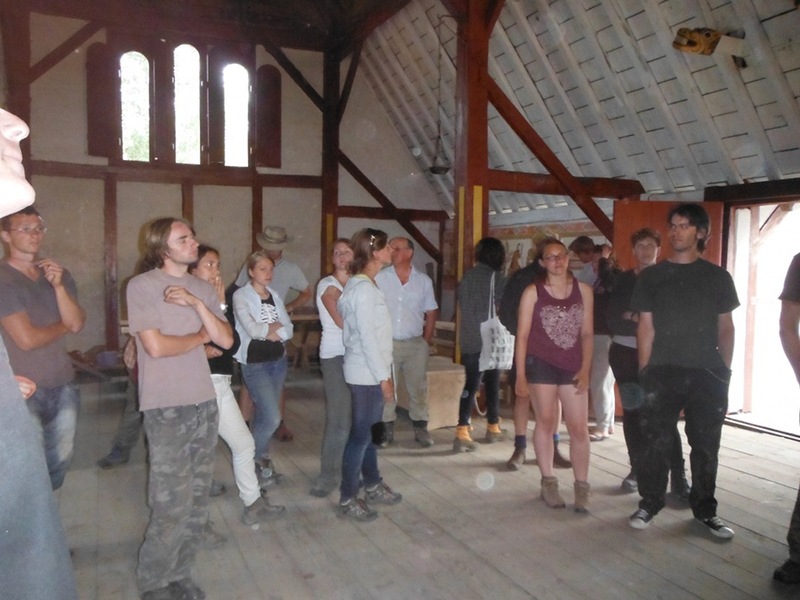 On Thursday last week we arranged a trip for the students to Wychurst, just north of Canterbury, the site of the reconstructed Late Saxon hall owned and built by re-enactment group Regia Anglorum, who were our invading Saxons on the Open Day. 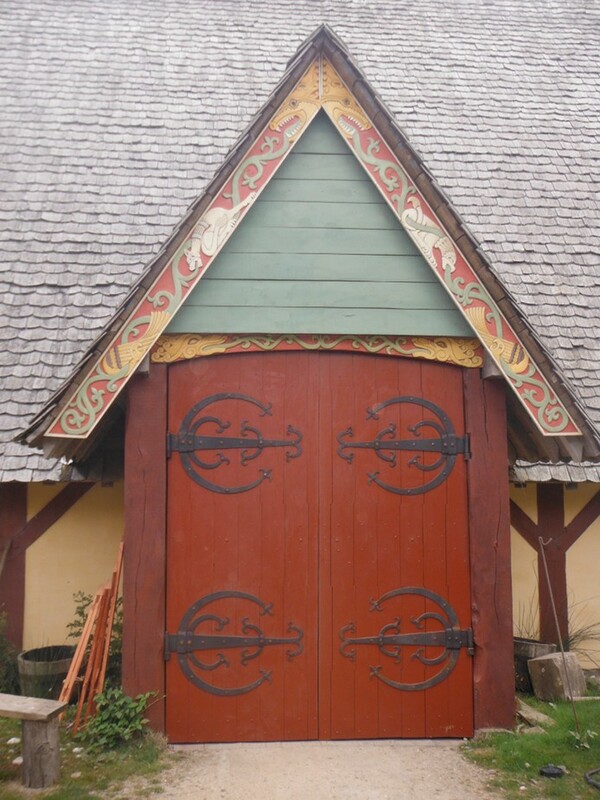 Their hall is based on the Late Saxon long hall at Cheddar, Somerset, and so in style post-dates ours by at about four hundred years. Even so, it was great to get an idea of the kind of space our hall might have been. It is very difficult to imagine the scale and size of the building at Lyminge, and Wychurst really brought it to life for everyone. 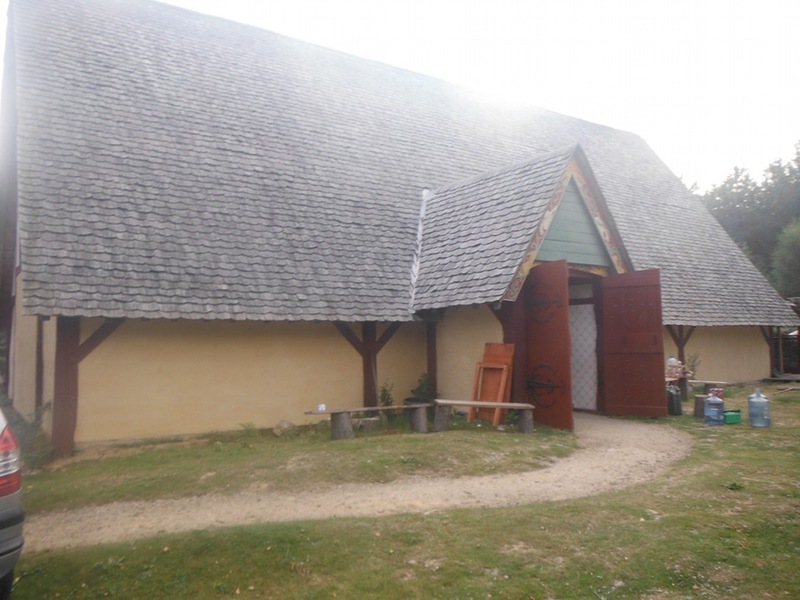 The reconstruction Saxon long hall at Wychurst, Kent, built by members of Regia Anglorum, the Saxon re-enactment society. They are researching the possibilities for decoration – something that of course does not survive archaeologically, but is almost certain to have existed. 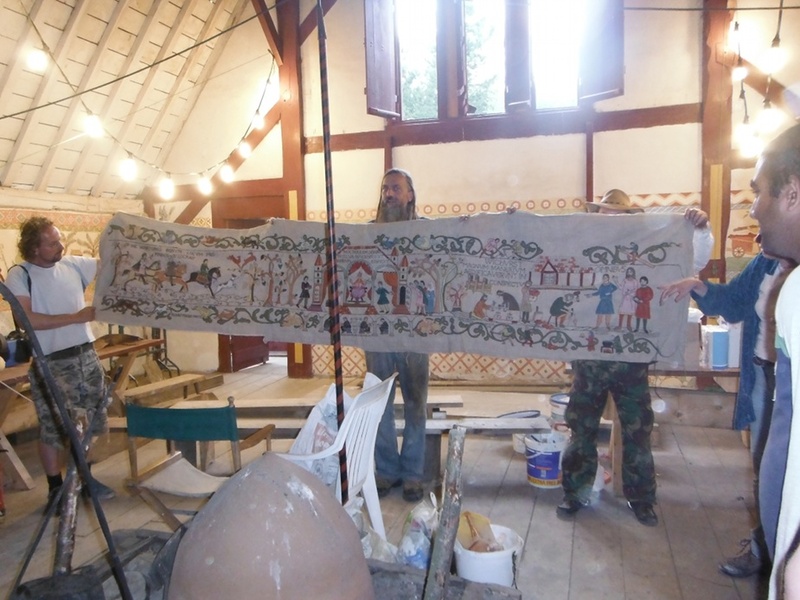 At Wychurst, Regia are painting onto the lime-plastered walls scenes in the style of the Bayeux tapestry, very well researched but with added women – there is only one woman and one child depicted on the Bayeux tapestry! Different tasks from different seasons are represented, and they are using only natural pigments available to the Saxons. The array of colours available always takes me by surprise. 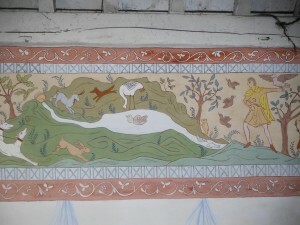 They are also doing their own version of the Bayeux tapestry, telling the story of their society through textile. 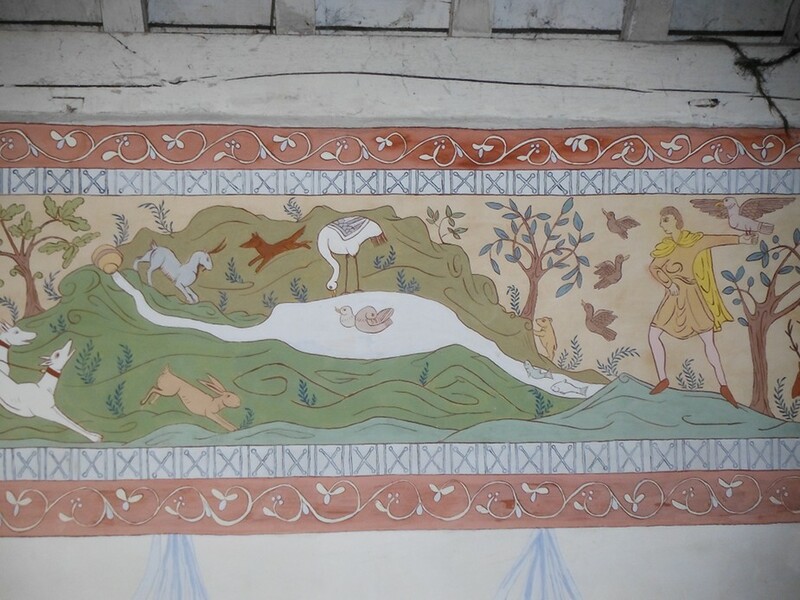 Part of the tapestry that is being made by members of Regia Anglorum to tell the story of the founding of the re-enactment society and the building of Wychurst. The hall is currently being painted, hence the modern lighting and other bits and pieces here and there! Visitors to the dig might have heard a strange humming noise recently. Bill Laing, one of our local residents and another fantastic supporter of the excavations over the years, has a brilliant piece of kit that is going to enable us to take aerial shots of the dig. 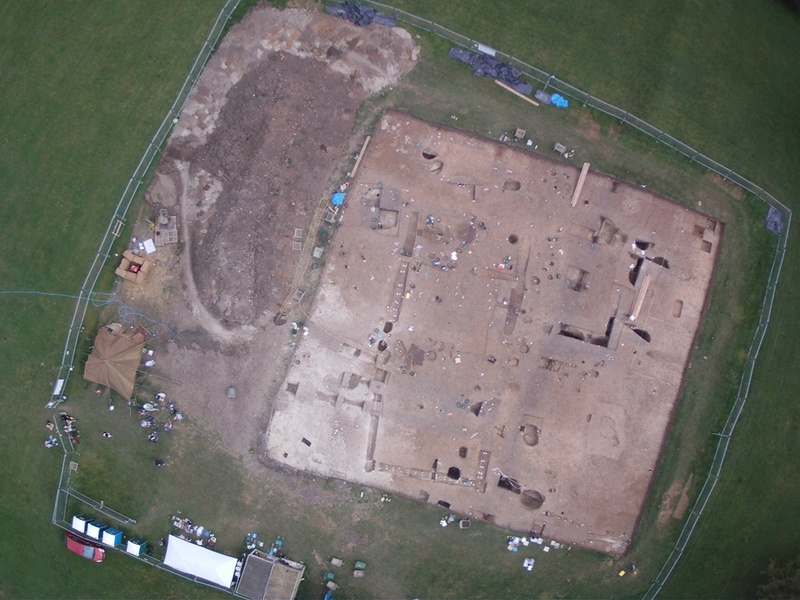 Some of you might have seen the photos from Silchester Roman Town (the University of Reading training excavation) that were taken with a helicopter drone. 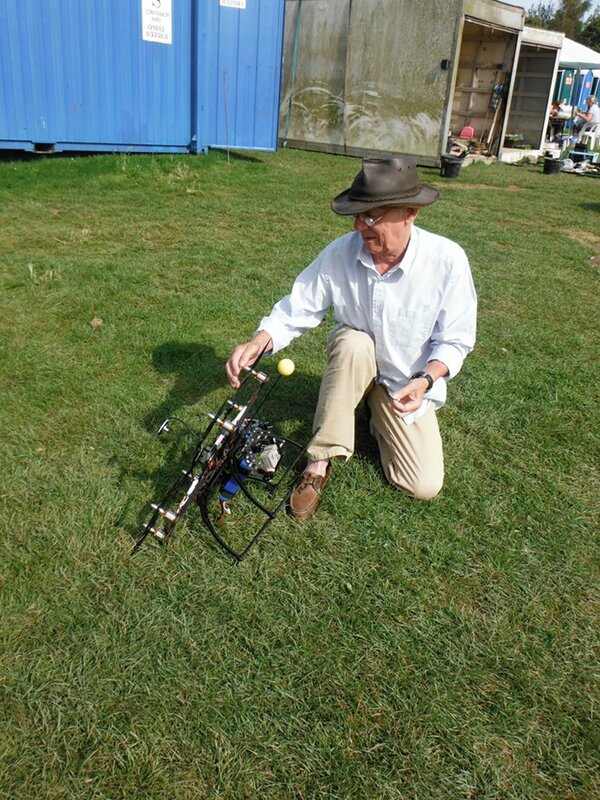 Funnily enough, before Silchester put their photos on their blog, Bill had already tested out his helicopter with us! 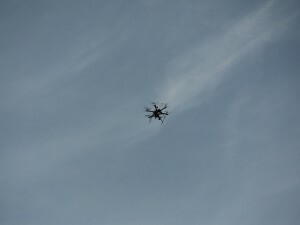 We had no idea they’d used similar technology at Silchester. Bill and his helicopter drone that can fly vertically. He has used it to take pictures of the trench. Bill has built his own drone and attached a camera, which, after several test flights and a very dodgy gust of wind, provided us with this amazing aerial shot of the whole dig. You can see the floor plan of the hall really clearly, even though we haven’t finished excavating it yet and the sun has really dried the site out. Not only are these aerial shots really useful to us, and indeed everyone who has been straining to see the hall building on site tours, it’s also really great that we have yet another way that a local resident has got involved in the project – this is the kind of knowledge and expertise we’re always looking for locally rather than having to bring people in. Our sunken-featured building is at last bottomed in two quadrants, and we’re finally starting to take down the other two! We have several post holes coming up which will help us to understand how the building was constructed. 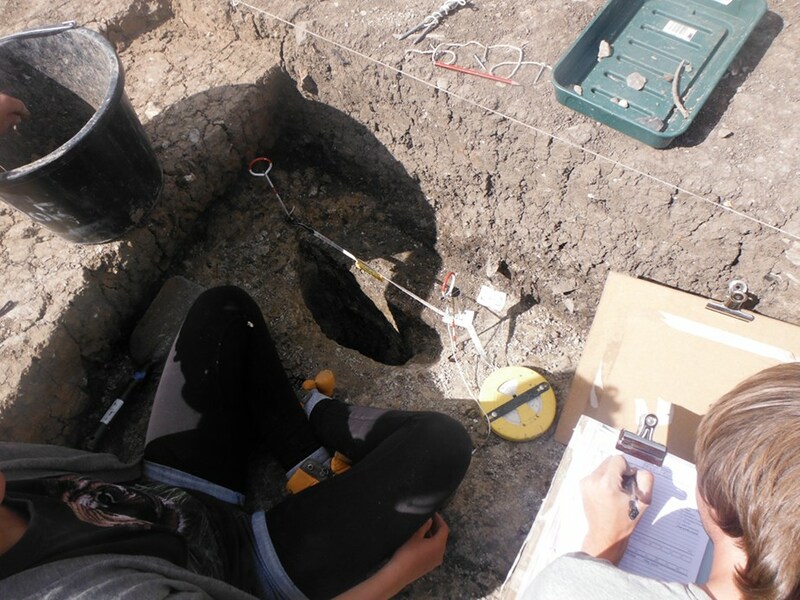 We’re starting to take micromorphological samples now that we know the true depth of the SFB pit. These samples will tell us exactly how the build up of waste within the SFB pit occurred. 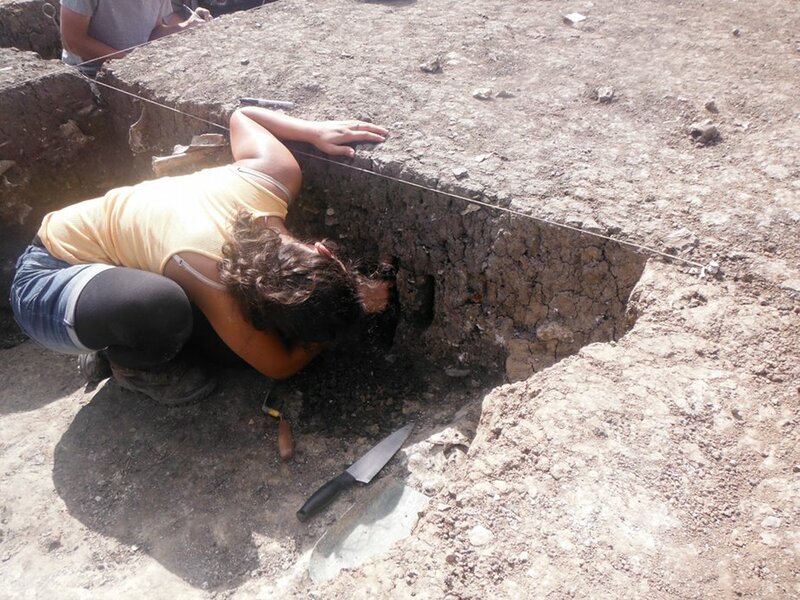 Carolina is cutting around a carefully measured block of soil that will be impregnated with resin, carefully sliced through into thin sections when solid, and examined under a microscope. 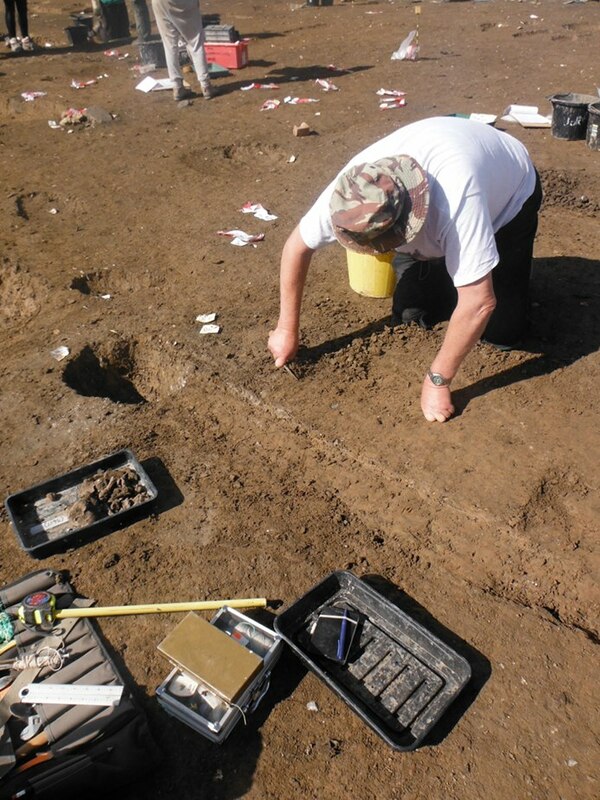 We take block samples across the different layers to see how the horizons change and this enables us to get much finer detail for features such as sunken-featured buildings which may have been backfilled in very particular ways. We’ll be taking micromorphology samples from some of the cess pits too, any where that has good strategraphic preservation and interesting deposits. We’re excitedly waiting to see what the last week will bring, particularly when the whole of the hall building and sunken-featured building are done and the floor plans of both are clearly visible. I’ll bring you pictures of the trench in its final incarnation very soon!